Russia has agreed to move towards building a nuclear power plant in Venezuela as part of the latest set of trade agreements between the nations. On 5 October Presidents Dmitry Medvedev and Hugo Chavez spent about one hour discussing energy issues before signing a package of deals described as an 'action plan' for the next four years. Among other things, it covers joint development in oil and gas as well as nuclear energy. The Russian state nuclear corporation, Rosatom, said agreements provide for the turn-key construction of a twin reactor nuclear power plant based on VVER-1200 pressurized water reactors as well as a research reactor for medical and industrial isotopes. The countries will also work on supporting infrastructure necessary for "the transition to the active phase of construction." cocoa powder: "Let it go on sale all over Russia, and it will be cheap too. It's the best in the world!" 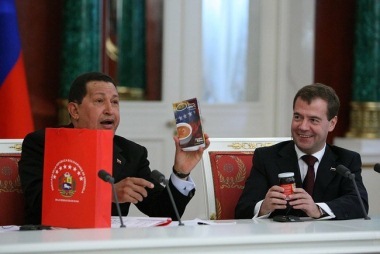 Medvedev said: "The President [Chavez] said that some countries will feel various emotions upon hearing this news. I don't know about that, but I do want to say quite clearly that our intentions are totally clear and transparent. We want our partner, the Bolivarian Republic of Venezuela, to have the full range of energy possibilities, energy independence, and domestic mechanisms for self-development. In this respect, even a country with as much oil and gas as Venezuela needs to develop new energy sources. I therefore think that our cooperation is a very good symbol." Russia and Venezuela have been discussing nuclear energy for about eight years and completed a nuclear cooperation agreement in November 2008. Iran is another country with links to Venezuela's nuclear development through geophysical surveys for uranium. On that topic Chavez said, "We have not yet signed a single final agreement, but we are moving in that direction." Chavez noted a research reactor that ran in Venezuela from 1960 to 1994. "Naturally, it was an enormous contribution not only to Venezuelan economy," he said, "but also that of its neighbouring nations, with an eye toward the future."